You may have bought an Apple Watch because it looked cool, and you thought you would be able to flaunt the way you read messages and access apps or be able to make or receive calls from the Watch itself. It is possible you did not know this smart gadget could actually save your life. But that is exactly what happened with James T. Green, who posted his experience on social media. “Never thought a stupid lil (little) wrist computer I bought two years ago would save my life. Saw my heart rate go up, ended up being a pulmonary embolism,” wrote @jamestgreen on his Twitter handle. It was detected on time and treated. There are others who have been saved by an Apple Watch, a cursory glance at social media suggests. “If healthcare is designed in a way that doesn’t wait until you get sick, to keep you healthy before that happens, it changes the game,” Vishal Gondal, founder, GOQii, said at the Slush Tokyo 2018 entrepreneurship conference on 28 March. GOQii offers what it calls a complete health ecosystem—a fitness band, an app that works with the band, as well as personal nutritionists, trainers, and wellness experts, and gives access to a certified general practitioner for consultations—the subscription costs Rs1,999 for three months. On 29 March, Apple announced that patients of NYU Langone Health, Stanford Medicine and 40 other health systems, representing hundreds of hospitals and clinics across the US, could now view their medical records on their iPhones. The updated Health Records section the Health app will let users see medical information from various institutions, allowing for better monitoring. “People hand you all sorts of things these days, and more data is almost never bad, but when they show up with paper, how do you summate that?” said Robert Harrington, cardiologist and chairman of the department of medicine at Stanford, in the official announcement. Apple has clarified that the Health Records data is encrypted and protected with the user’s iPhone passcode. It is only be a matter of time before we see this in India too. Many wearables, such as those also made by Fitbit and Garmin, can track daily activity, map movements with location tracking, monitor sleep, count calories (as long as you feed data on what you eat into the corresponding app) and suggest diet plans. But they aren’t all the same. To calculate heart rate and rhythm, Apple Watch’s sensor (you can find this on the flip side of the Watch) uses green LED lights flashing hundreds of times per second and light-sensitive photodiodes to detect the amount of blood flowing through your wrist. The sensor’s optical design collects signals from four distinct points on the wearer’s wrist, and then relies on complex algorithms to isolate heart rhythms. If, for instance, it detects an unusually high or low heart rate, it will notify you that you might need to visit your doctor soon. “The way is scientific. Usually, fitness watches pick up the heart rate by the pulse, by a principle called stethography. The principle, per se, is correct. But we need to see what technology they are implementing to pick up the heart rate,” says Vaibhav Mishra, a senior consultant and head of cardiac surgery at the Fortis Hospital, Noida. This is pretty much the way most heart-rate sensors work in other wearables—including Fitbit’s new Ionic smartwatch. The Apple Watch is widely considered to have the most accurate sensor. The Switzerland-based Molecular Diversity Preservation International and Multidisciplinary Digital Publishing Institute (also known as MDPI) published a study in May that evaluated the Apple Watch, Basis Peak, Fitbit Surge, Microsoft Band, Mio Alpha 2, PulseOn, and Samsung Gear S2. “The Apple Watch achieved the lowest overall error in both heart rate (HR) and energy expenditure (EE) calculations, while the Samsung Gear S2 reported the highest,” the research found. The Apple Watch not only tracks heart rate, it also detects abnormal logs based on past history. It can track the heart’s recovery rate after a workout and during the cooling-down period, which is data doctors use to measure the fitness of a heart. One common heartbeat irregularity is atrial fibrillation (also known as Afib)—Afib occurs when the two upper chambers of the heart don’t beat in sync with the two lower chambers—it’s caused mostly by fluctuating blood pressure, and can increase the risk of everything from heart attack to dementia. “It’s basically an abnormal rhythm of the heart wherein the heart beats faster than usual. There’s also a discoordination between the chambers of the heart, in terms of beating. While it is not life-threatening, it does cause a lot of discomfort to patients and needs some sort of medical intervention,” says Dr Mishra. The Apple Heart Study app uses this technology for an initiative in the US: If an irregular heart rhythm is identified, participants receive a notification on their Apple Watch and iPhone, a free consultation with a doctor, and an electrocardiogram (ECG) patch for additional monitoring. Apple is partnering with Stanford Medicine to study irregular heart-rhythm related conditions in humans. Cardiogram is an app that works with the Apple Watch. The app uses the DeepHeart neural network that is designed to identify and predict any potential cardiovascular risk. These include Afib, sleep apnoea and hypertension. According to the World Health Organization, more than one in five people have high blood pressure, with complications from hypertension accounting for 9.4 million deaths worldwide every year. The Cardiogram app showed 97% accuracy in detecting atrial fibrillation when its algorithm was tested against an in-hospital test called cardioversion. The app developers worked with researchers leading the University of California San Francisco’s Health eHeart Study over a period of 14 months, which ended this March. The researchers collected 139 million heart-rate data points from 9,750 fitness wearable users, including Apple Watch, TicWatch and Garmin wearables. “DeepHeart can predict diabetes with a c-statistic of 85%, high blood pressure at 81%, and sleep apnoea at 83%. These results indicate that wearable devices can be used for large-scale, low-cost disease screening,” says Avesh Singh, a software engineer at Cardiogram. According to data published by the research firm Canalys on 1 March, around 37.9 million wearables were shipped globally in the Q4 2017 across all brands. The Apple Watch led the way with 8 million units, while Fitbit shipped 5.4 million units. Clearly, wearables are catching the fancy of consumers, and ever-improving hardware and software are allowing doctors to rely on the data these provide. Insurance company Aetna will give out 500,000 Apple Watches to customers as part of a pilot programme, in the hope that apps co-developed with the insurance company will help users adopt healthier lifestyles, thus reducing load of insurance claims over time. 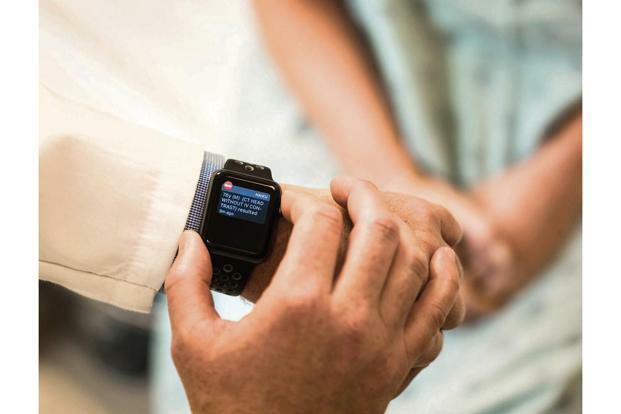 “If we can make it work, it will be well worth it for us to give everybody an Apple Watch, but we’ve got to get the technology right,” Mark Bertolini, chief executive officer, Aetna, had said at the annual Techonomy conference in California in November. This isn’t the first time fitness wearables are becoming part insurance packages. UnitedHealthcare, a US-based insurance company, will be offering credits worth up to $1,500 (around Rs97,000) to customers who use a Fitbit Charge 2 fitness band.